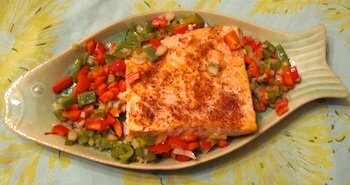 This easy Cajun salmon recipe combines zesty flavors from the Louisiana bayou with tasty salmon, red and green peppers, and onions. You’ll love that preparation for this versatile baked salmon recipe with Cajun spices takes just 5 minutes – maybe even less. Buy salmon filets with skin on or off, or buy salmon steaks – whichever you prefer. You can also buy a jar of Cajun spices at the store – or use this recipe to make your own. We often make this easy baked salmon recipe during the week because it’s so fast – just prepare some rice and perhaps a green salad, and you have a complete meal. But it’s also one of the best salmon recipes for when guests come over because it’s delicious and virtually foolproof – like any fish, don’t overcook it! Set the oven to 375°F. Add the olive oil and white wine to a shallow 13×9 inch baking dish. Put the salmon into the dish. If you’re using a filet with the skin still on, put the filet non-skin side down. Chop the peppers and onion into small pieces. Flip the salmon over. 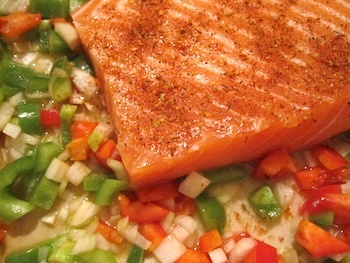 Spread the peppers and onions around the salmon, and stir them gently with a spoon to coat them with the oil/wine mixture. Sprinkle the Cajun spice mix over the salmon. 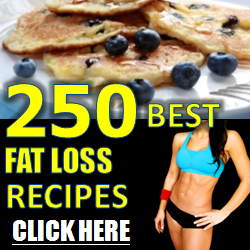 Use 1 teaspoon for a mild flavor, and 2 teaspoons for a stronger flavor. Sprinkle the salt over the veggies. Bake for 10-15 minutes, just until the salmon flakes easily when you test it with a fork. The exact baking time depends on the thickness of the salmon. Carefully lift the salmon out of the cooking dish and place it on a serving platter. Distribute the peppers, onions, and any remaining cooking liquid around it, and serve it to your lucky guests or family.